As days grow shorter and the chilly air blows us home, it's nice to bring some of the outdoors in to admire by the warmth of the fire. The kids and I created a space in our cabin where we can study this season's beauty in the comfort of hearth and home. We wanted our winter nature nook to delight all five senses. 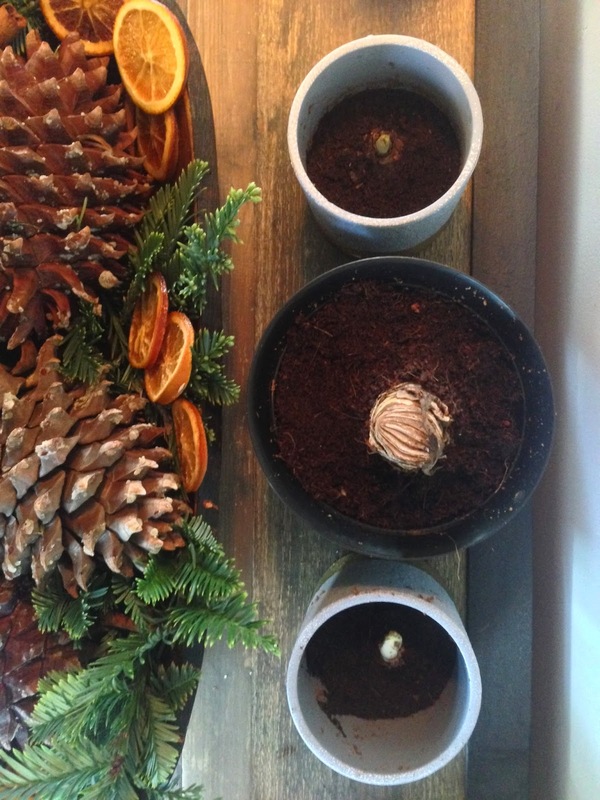 There are cinnamon sticks and dried orange disks to smell and touch, warming candlelight, bright red Christmas Berries to look at, Paper Whites and Amaryllis bulbs to watch grow each day. 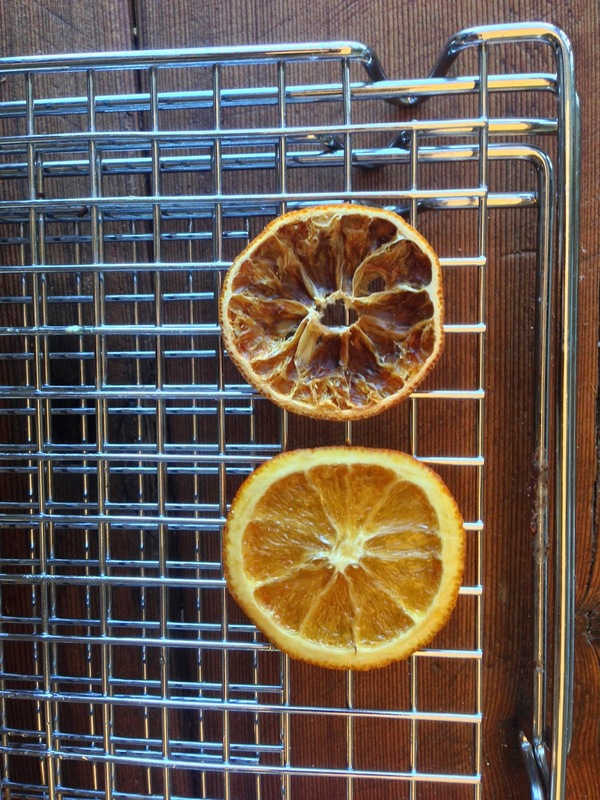 To make dried orange disks, simply slice 2 oranges as thin as you can, toss disks in 1/2 cup sugar, and dry in the oven or dehydrator at 200º for 2 1/2 hours. We tried making a batch without sugar and what we got are brown disks pictured below (the brightness of the other disk was preserved by using sugar). It felt good to step away from the business this season can bring, take a deep breath, and collect treasures from creation with the kids. Their creativity was activated and a peace entered the house as everyone crafted elements of the nature nook. We love how it all came together, and checking the bulbs' growth progress each morning has become a before-breakfast ritual. I do think we have started a new family tradition. Preparations are well underway for our family to be a part of a wonderful bazaar our church holds annually. This is no ordinary boutique. Thousands walk the isles to browse the vendor's offerings. My kids have begged to sell something, anything, for years, so I wrote it into our Homestead Day curriculum (more on that soon). The hope is that the kids learn a thing or two about money: marketing, pricing, and economics in general. It's been fun to watch their excitement rise, the closer it gets to setting up our little farm stand and revealing the fruit of their hard work. Us grown-ups joined the fun, too. 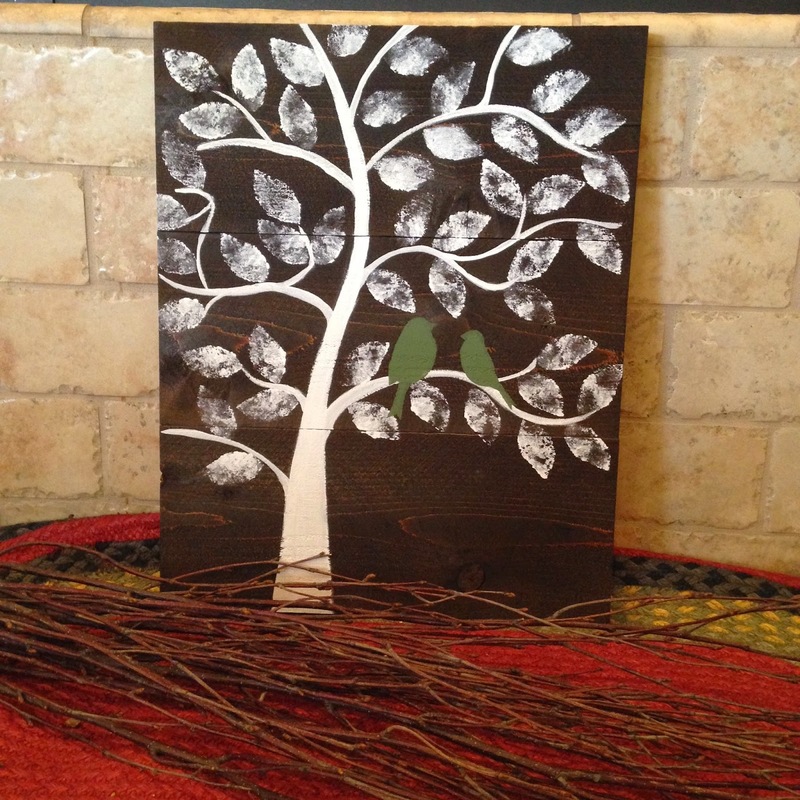 My mom has made some gorgeous, hand-crafted woodworkings, a newfound love of hers, and she is good. 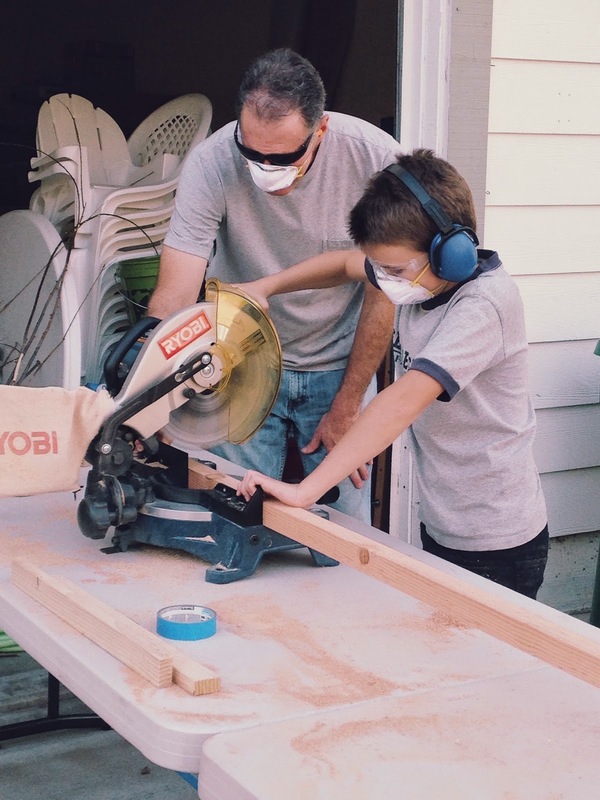 My dad helped our oldest son to make stilts, something he helped my brother and I make and sell when we were kids. Oh, the memories that came flooding back! We used to have countless races and tournaments on those stilts. Any time friends came over, they would make a beeline to them and the championships would would resume. I hopped up on an old pair we made as kids at my daughter's birthday party and became ten again. I literally had to bite my tongue (as seen in the photo above) so as not to challenge the poor nine-year-olds to a battle. I always win, you see. Always. I think I need to invite some of my friends over for a battle so I can dominate once again. Fierce stilt competition is not something one outgrows easily. Our oldest daughter and her friend have made some rad raw-hem tank tops that they designed themselves. The last batch was just finished last night and they are so cute! I'm really impressed. 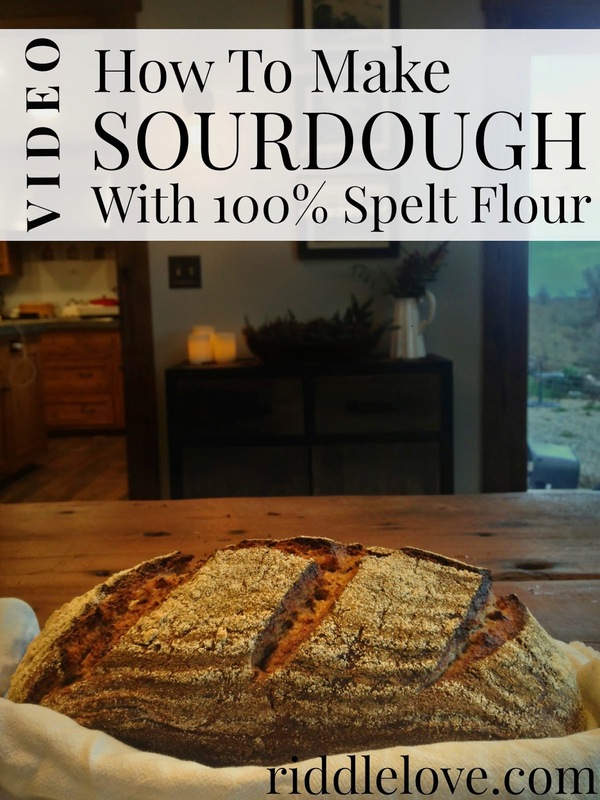 Our younger girls and I have added several sourdough items to the farm stand, including (sour)doughnuts, loaves of rustic sourdough, and sourdough starter, all made with only spelt. They will also help to ladle organic hot apple cider made from scratch into mugs for our customers. If you are in the area, I do hope you stop by and say hello. We'll be the booth with millions of kids and matching aprons that my mom made for us all. Our little farm stand will be open for business this Saturday, November 22 from 3:00-8:00 at the Bethel Bazaar. You can follow our progress on Instagram as we make the final push until the big day. The fact that I am posting a cauliflower recipe means that there has been some serious palate-healing. It was one of the two veggies that made me gag as a kid. I hated everything about that pale cruciferous: the rotten smell while it steamed, the deceitful whiteness making one think it might taste something like potato, then the massive shock and disappointment when that first bight confirms otherwise. If you would have told me as a child that I would grow up to one day love, and even crave cauliflower, I'd laugh in your face. Yet here I am, grown-up Katie, happily sharing a recipe that in fact has become my husband's favorite soup to come out of this kitchen. Miraculous. A note on this soup: It can be a wee bit on the watery side since there is no flour to thicken it up. A simple remedy to that is peeling and cubing 2-4 potatoes or sweet potatoes and adding them in with the cauliflower. I tend to avoid this simply because it adds more time to the process and we don't mind the consistency. Place grease in soup pot and heat until melted. While the grease melts, chop onions, then add to pot and sauté for about 3 minutes. While onions sauté, chop cauliflower, then add to pot. Stir in smoked paprika, peppers, and thyme. Add stock. Stir, then cover and let soup simmer to a light boil for 15 minutes. While the soup simmers, grate cheese and finely cube Canadian bacon. 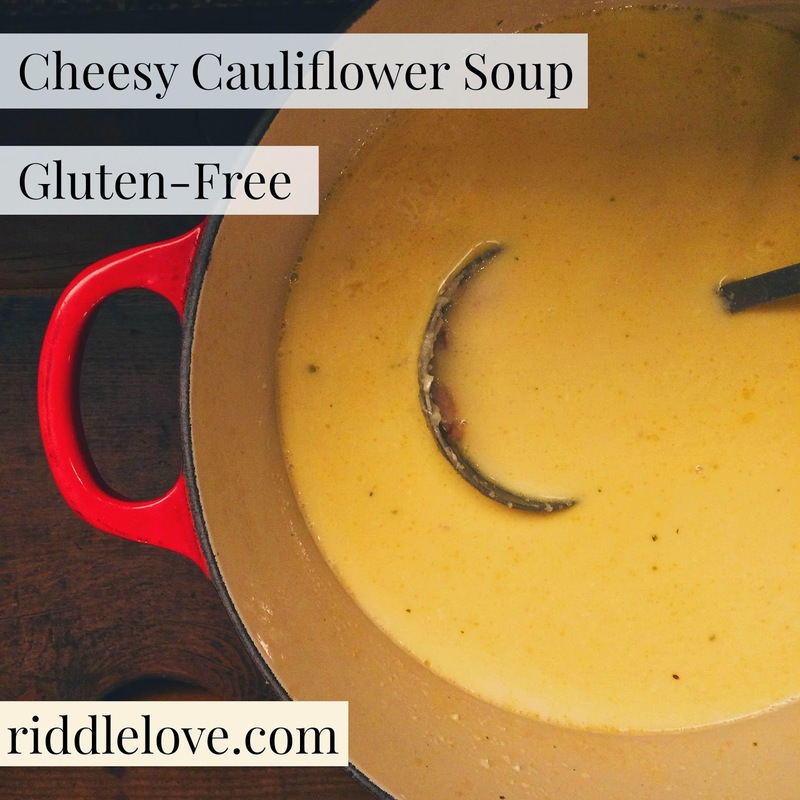 Once soup is done simmering and the cauliflower is soft, turn off heat source and add creme fraiche, cheese, and salt. Blend with an immersion blender or in batches in an upright blender. Stir in cubed Canadian bacon or ham and reheat on low if necessary. Ladle soup into bowls and garnish with finely-chopped sautéed mushrooms for added flavor and to increase immune support, if desired. I have another confession to make. In a desperate attempt to keep the proofing dough from sticking into the basket during the shoot, I greased the basket with ghee and then liberally floured it with rice flour. It is now official that I am not a real sourdough artisan. It gets worse. I keep greasing the proofing basket with ghee because now I get a beautiful loaf 100% of the time. One of these days I'll grow up and leave my crutch of ghee in the corner, but for now, it keeps me limping along. The cool thing about sourdough is it really can be adaptable. I'm going to list tools and supplies you can use around the house as well as the up-your-game version. If you are new to sourdough, I encourage you to try it out for size using what you already have around the kitchen for at least a month before committing financially by investing in more expensive gear. Just remember that if you end up loving the process of sourdough, your loaves will turn out even more magnificent once you get those new toys. Spelt flour. Store-bought will work fine, but when you're really ready to commit to this bread-making thing and want the best results and highest-nutritive-value loaf, you won't regret having a WonderMill in your kitchen. Flour is also less expensive to mill yourself, and makes 8 cups of flour in two minutes. Be sure to store freshly-milled whole-grain flour in the freezer to keep it fresh. I also mill the rice flour used to flour the bowls and baskets with this mill. A glass or ceramic bowl for souring. My favorite is the lidded glass bowl shown in the video. Sourdough starter. I used this one, followed the instructions provided in the packet, fed it all-purpose flour for about a week until it was well established, and gradually fed it spelt until it became all spelt. A wooden or plastic spoon, or non-reactive stainless steal for mixing. Up your game with this Danish wood whisk. I adore mine. A bowl lined with a floured dish towel for proofing, or make your loaf gorgeous, darling, with a proofing basket. Bake your loaf in anything with a lid, but I'm telling you... Once you get a clay baker your bread will forever be better. They also make ridiculously delicious, moist roast beef/chicken/meat in general. (If I want bread for lunch or dinner, I start this process at 4:00 the afternoon before.) Pour water into mixing bowl. Heat honey until it's liquified and whisk into the water. Whisk starter into the water mixture. Mix salt into flour, then incorporate them into the water mixture. Stir and kneed until everything is really incorporated. Cover and set your timer for one hour. After an hour, remove lid and stretch the dough at every angle to activate gluten. Place dough back in bowl, cover with lid, and set timer to 30 minutes. Come back to your dough at 30 minutes and stretch again. Place back int bowl and cover again. After 30 minutes, pull the dough again. Place back in bowl, replace lid, and set timer for an hour. After an hour, it's time to pull the dough one last time, then replace lid and let sit overnight or 12 hours in a warm place. The next morning, after 12 hours of rising, heavily flour a bowl with a tea towel over it or a proofing basket with rice flour. Pick up the dough and form a smooth "top" the shape of your proofing bowl until it's nice and smooth and place the smooth part resting into the proofing basket or bowl. Cover and let rise for an hour and fifteen minutes. After it's been an hour and fifteen minutes, place baking vessel into the oven and set the oven to 500º. Once the oven has reached 500º, quickly and carefully remove baking vessel from oven and close oven. Quickly and carefully flip dough into the baker so that the bottom part is now facing upward. Score the dough with a really sharp knife or razor blade to guide the cracks in the crust. Place lid on the cooking vessel and place in oven. Immediately turn oven to 450º and bake for 35 minutes. After baking for 35 minutes, remove lid and let crust brown for 5-10 minutes. You want the crust to come out with a dark brown crust, and even little bits of blackening on the tips of where you scored the bread. Remove bread from baking vessel. You will know the bread is done when you knock it and it sounds hollow and the bottom of the loaf is dark brown. Sourdough should be fully cooled before eating, and the flavor doesn't peak until day two or three, but we have been known to be impatient and cut into a warm loaf, slathering it with grass-fed butter or (my personal favorite) eating it with a slice of organic raw white cheddar. I put together a list like this a couple years ago (you can see it here) and still very much stand by those suggestions. This compilation was created as a continuation of that list. Everything on here has been personally enjoyed here in our home over the years and comes highly recommended. How fun would it be to give a gift basket for the baker/gardener/cook/crafter/homesteader/coffee drinker/fermento/child in your life? I guess I love themes. 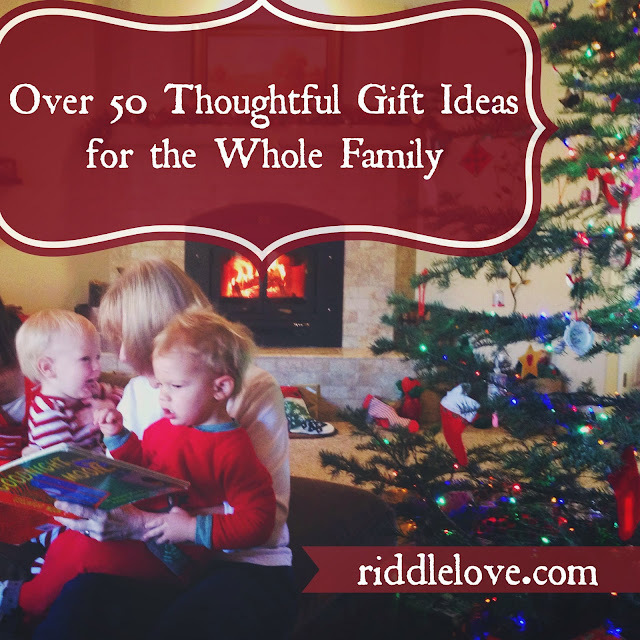 Many of these suggestions would also make beautiful gifts or stocking stuffers all by themselves. I like to veer away from just giving "stuff" that will likely fill the dump in a month or two and instead invest in one or two meaningful gifts that the receiver will actually enjoy, and is even inspired to go after their interests even more. I hope you find this helpful. Please add any suggestions you may have in the comments below. WonderMill ~ Mine is almost ten years old now and is going strong with heavy use. Although it's quite an investment, you just can't beat the flavor that freshly-milled flour imparts to breads, cookies, and cakes; not to mention the major increase in nutrition and decrease in the cost of flour when you mill your own. It has three settings for pastry, bread, and coarse and mills eight cups of flour in less than two minutes. Clay Bakers ~ Not only do these bring your bread-making game up to a professional level, you can craft some incredible roasts and whole chickens in these guys. I do believe they are totally worth the investment. Also? They are a clean, non-toxic way to bake your food, and are naturally non-stick without any chemicals. Proofing Baskets ~ These babies are what take your loaves from just homemade to artisan. You know those cool markings found on super-expensive breads you buy at high-end bakeries? It's because they let the final rise happen in these proofing baskets. Danish Dough Whisk ~ I love using this especially for wetter doughs, like with spelt flour. It's incredible how effective it is! Bowl-Scraping Spatula ~ This is my all-time favorite spatula ever. It doesn't leave any of the precious dough behind in the bowl and it is effortless to use. Lidded Bowl for Rising/Souring ~ Even though they aren't nearly as pretty as a traditional bread bowl, I love these because no disposable plastic is needed to cover rising dough and the dough doesn't dry out like it can when using a cloth. The lid does the trick! A good bread knife ~ Home-crafted bread deserves the courtesy of being cut with a good, sharp bread knife. This is the one I have used and loved for years. Once you use a well-made knife, it's pretty card to carve and cut with anything else. Tartine No. 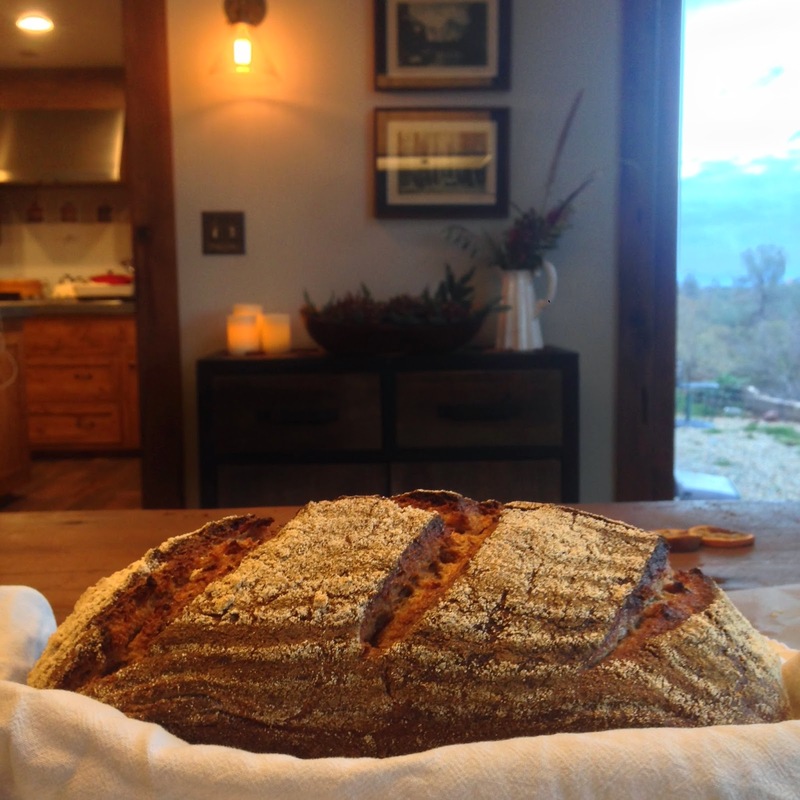 3 ~ A very inspirational recipe book using whole grains, written by Chad Robertson, the legendary sourdough genius and owner of the famous San Francisco Tartine Bakery & Cafe. Heirloom Seeds ~ All heirloom seeds are GMO-free and naturally genetically diverse and disease-resistant. My favorite companies are Annie's Heirloom Seeds and Baker Creek. Garden Bucket ~ How fun would it be to make a gardener's "gift basket" with a five-gallon bucket lined with this caddy, filled with heirloom seeds and shiny new hand tools? Hand Tools ~ Mentioned above, but could also fill a stocking fast. Favorite Gloves ~ Nothing beats a good gardening glove (or two). Lasagna Gardening ~ My new favorite gardening technique. Rodale's Ultimate Encyclopedia of Organic Gardening ~ Simply a must-have. Vegetable Garden Problem Solver ~ Currently devouring this book myself. Nourishing Traditions ~ Another must-have for every healthy kitchen. Nom Nom Paleo ~ Probably my favorite cook book purchase this year. Truffle Salt ~ A delicious indulgence that brings "umami" to pretty much any savory dish. A little bit goes a long way! Fair-Trade, Organic Chocolate ~ Can anyone say, "yummiest stocking stuffer ever"? 2-Ounce Angled Measuring Cups ~ I have three of these and use them all the time for measuring vanilla extract, sourdough starter, making salad dressings... I was surprised how often they're in use and really glad I have three because I go through them so often. 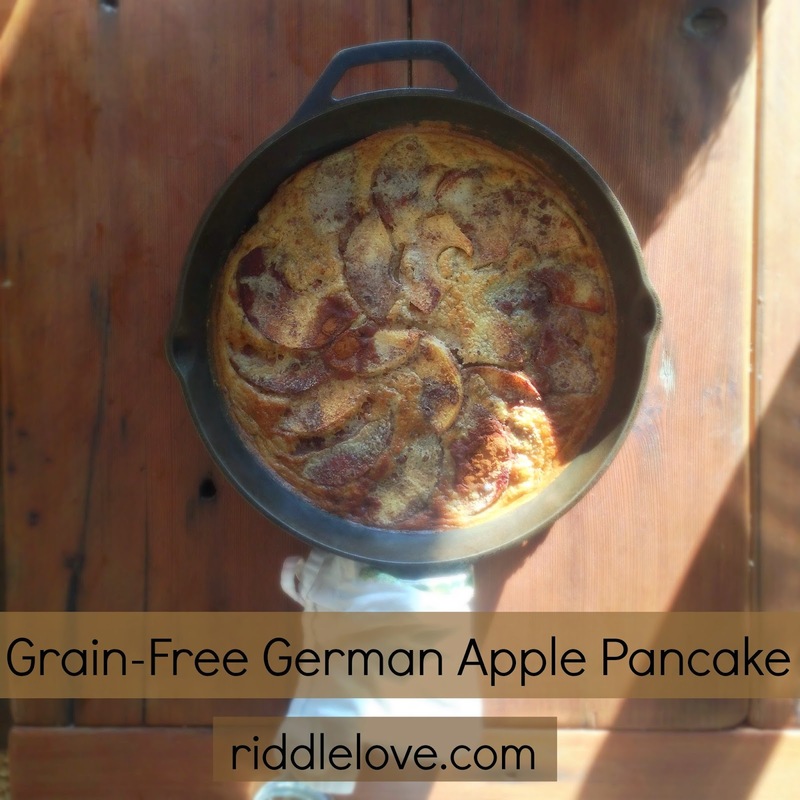 Cast Iron Pots and Pans ~ These are a must when you're wanting to get away from toxic non-stick pans. These are naturally non-stick when seasoned properly and can go into the oven and on the stovetop; and campfire! Clay Bakers ~ These were already mentioned in the baker's gifts but are also incredibly valuable for roasting meats and veggies. You'll never roast a piece of meat any other way! Ceramic Pots and Pans ~ The next step up from regular cast iron pots and pans mentioned above. Ghee ~ My favorite fat for stovetop cooking because of it's high smoke point (prevents fat from becoming carcinogenic) and nutrient density. Also it's GAPS-diet and Paleo-friendly! Grade B Maple Syrup ~ I mean, I'd swoon with some of this in my stocking. Vanilla Beans and Vodka to make this gluten-free vanilla extract recipe ~ Whether you make a cute vanilla extract kit for your favorite chef or give it to them made by you, nothing beats a good vanilla extract. Organic Yarn ~ Nothing beets the soft, clean feeling of organic when your crafter is knitting or crocheting something cozy. Bamboo Crochet Hooks ~ Why use plastic or aluminum when there's beautiful, smooth, sustainable bamboo? Bamboo Knitting Needles ~ Again. Natural is my favorite. Beeswax (for candlemaking) ~ A candle-making gift basket with the following three items? Heavenly. Cotton Wicks ~ no toxic lead in these beauties! 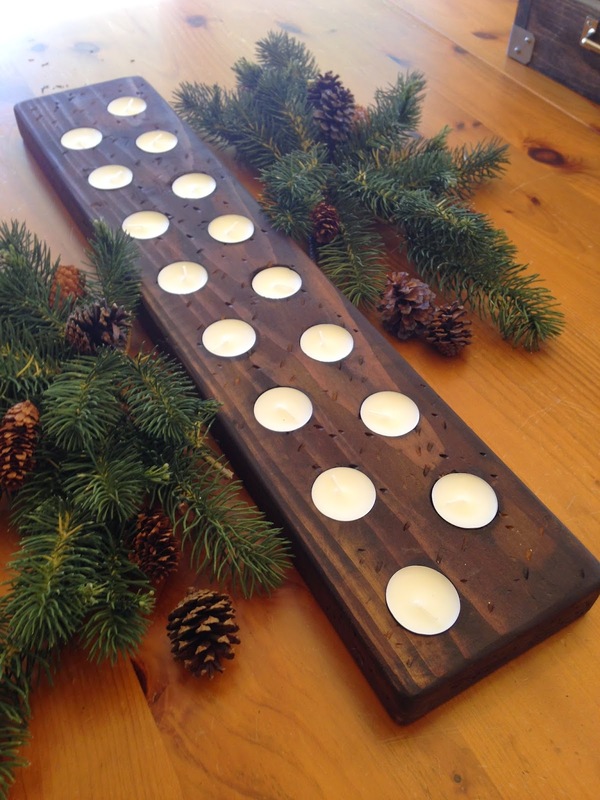 Candlemaking The Natural Way ~ A lovely, easy-to-follow book. Favorite Flower Shears ~ Also great for cutting fresh herbs from the garden! Floral Foam ~ Shears, floral foam, and the book below. I sense another stunning gift basket. The Plant Recipe Book ~ Recipes for impressive arrangements with flowers and clippings from plants. Home Roaster ~ Although this isn't the top of the line, it's been serving us well for five years and counting. Green Coffee Beans ~ You're gonna need some green coffee beans to roast, after all. Home Coffee Roasting book ~ ... and knowing how to roast the beans is always helpful. Fermenting Crock ~ Pickles, sauerkraut, brines, oh my! I adore my crock. Celtic Sea Salt ~ Gotta have good salt for all that pickling. The Art of Fermentation ~ You wanna culture/ferment/make cheese? I love this guide to it all. Beer-Cap Bottles ~ A must-have for bottling your own kombucha. You Can Farm (and any other book by Joel Salatin) ~ He's my favorite farmer-philospher ever. He doesn't just write about it; he lives it. Keeping Bees ~ Ashley English's books make everything homestead feel attainable and intriguing for the novice. Home Dairy ~ Because cheese. The Backyard Homestead ~ Now this book will make you salivate for growing your own food and that's a fact. Playsilk ~ Soothing for the baby and creative play for the toddler. I love a toy that grows with your child. Natural Teethers and Toys ~ They can gnaw on them while teething and play with them as they grow. What's In The Bible? DVDs ~ Our kids have learned so much from these DVDs. Even the older ones enjoy them. William Joyce Books ~ Gorgeously illustrated and I won't lie. They make me cry. Here Comes Heaven! ~ We loved going through this book during our nightly devotions. Origami Yoda Files ~ Our son devoured these books and has lent them out to several friends who did the same. Felting Starter Kit ~ A wonderful sensory activity while they listen to you read books. Darling Magazine (for young ladies) ~ My oldest daughter and I have really enjoyed reading through these together. "The Art of Being a Woman" is their subtitle. One read through their mission statement on the back of their publications and you will be hooked. Easy Carpentry for Kids ~ My brother and I actually worked through this book with my dad when we were kids. So many beautiful memories! As the mornings grow colder, I find myself wanting to tuck into something warm after waking up. The smoothies get moved to snacks, and breakfasts that come out of the oven are welcomed once again. I don't want to spend a whole bunch of time on breakfast; it's a busy part of the day over here. This new favorite tastes and looks like it should've taken a lot more time to make than it actually does. The key, my friends, is the right kind of tools. If your household likes apples and you don't already have what my kids call "The Amazing Apple Machine," please, for the love of everything good and pure, invest in one. I don't know about you, but I can't peel, core, and slice an apple in ten seconds by hand. 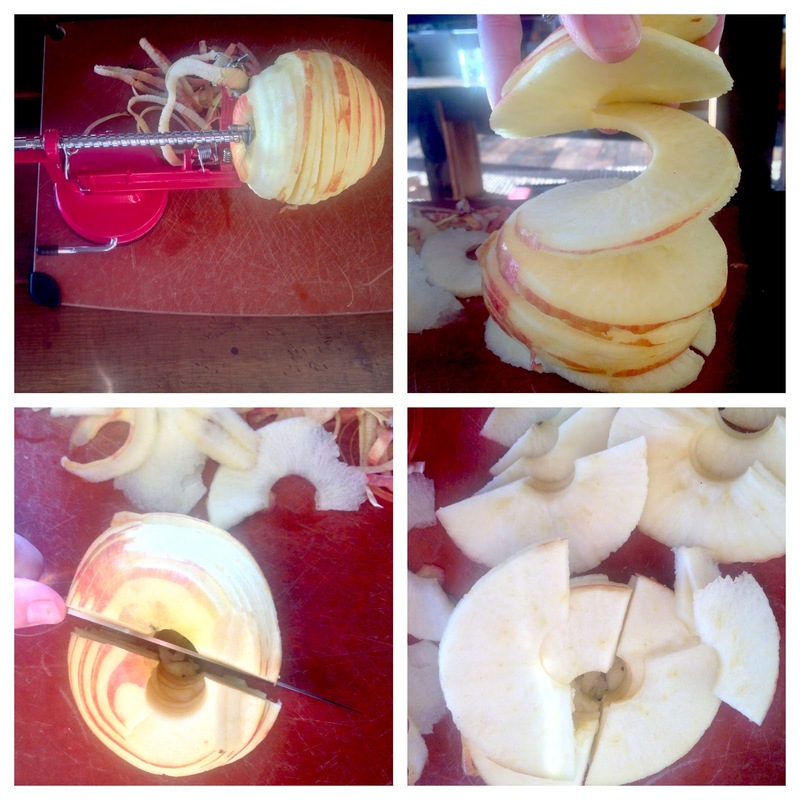 For this recipe, I whiz the apples through the "machine" and slice the spiraled apples in half. The slices are the perfect thinness to naturally cook just enough during the process of baking the pancake, so there's no need to pan-fry them ahead of time. You'll see what I mean in the recipe, but first, one more note. If you don't have to be paleo, please choose the buttermilk option over almond milk. Also, pretty please use butter instead of coconut oil. The paleo version totally works, but the flavor of good, organic dairy from grass-fed cows... I swoon. NOTE: If you happen to stumble upon a recipe that calls for coconut flour such as this one, you must only use coconut flour. Coconut flour is very different than any other of it's kind and cannot be substituted cup-for-cup with any other flour. You also cannot substitute coconut flour for any other kind of flour in a recipe or else you will end up with some sort of nasty. Moral of the story: Coconut flour recipes are for coconut flour only, and keep it out of any non-coconut flour recipes. Thank you. Carry on. Serves 8, prep time: 10 minutes, bake time: 15-20 min. Preheat oven to 425º. Put 1/3 cup butter in a 10-inch cast iron skillet or a 9x13 pan and place in oven while it heats up to allow butter to melt. Blend buttermilk, eggs, 2 tablespoons butter, syrup or honey, vanilla, coconut flour, and soda in a blender until smooth. Slice apples as seen above. Mix cinnamon and nutmeg together in a bowl. Add apple slices and toss to coat. Remove hot pan or skillet from the oven once the butter is melted. Arrange apple slices evenly on the pan. Sprinkle any residual spices over the apples. 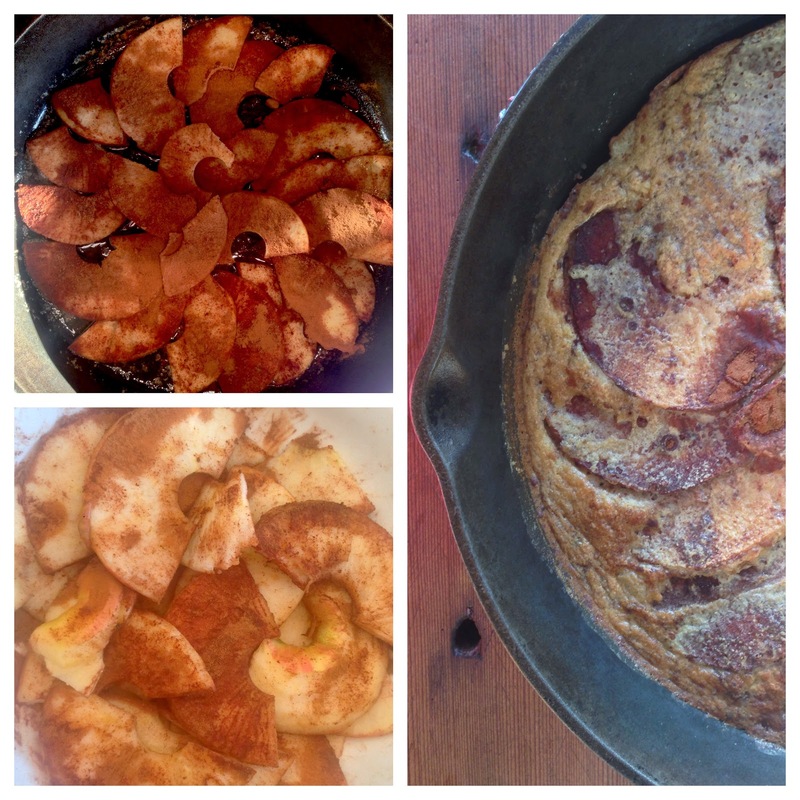 Pour batter over the apples and place pan or skillet back into the oven. Bake for 15-20 minutes, or until the center of the pancake is set. Cut into slices and serve hot with a dollop of butter and grade B maple syrup. 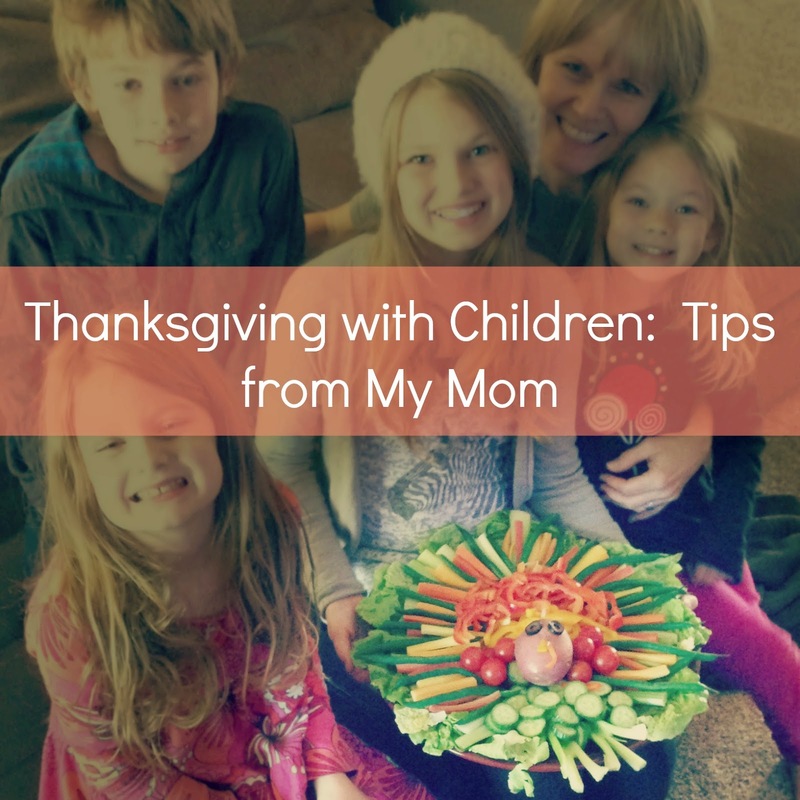 Wisdom From My Mother: Tips for a Fun, Successful Thanksgiving with Kids! Thanksgiving is coming. Does this bring excitement to your heart or do you shudder at the thought of it? Over the years, I've learned so much on how to host or contribute to big get-togethers by watching my mom do it so well. She never shooed us kids out of the kitchen. If there wasn't a job for us to do, she made one up. I really think this is why I adore holidays and hosting so much. It brings such memories of togetherness from years past. There was always a job if I wanted one, and being involved in the preparation might have been the most enjoyable part of the holidays for me; and still is! Here's a link of the turkey we mentioned in the video, as well as the penguins she made with the kids in the winter. 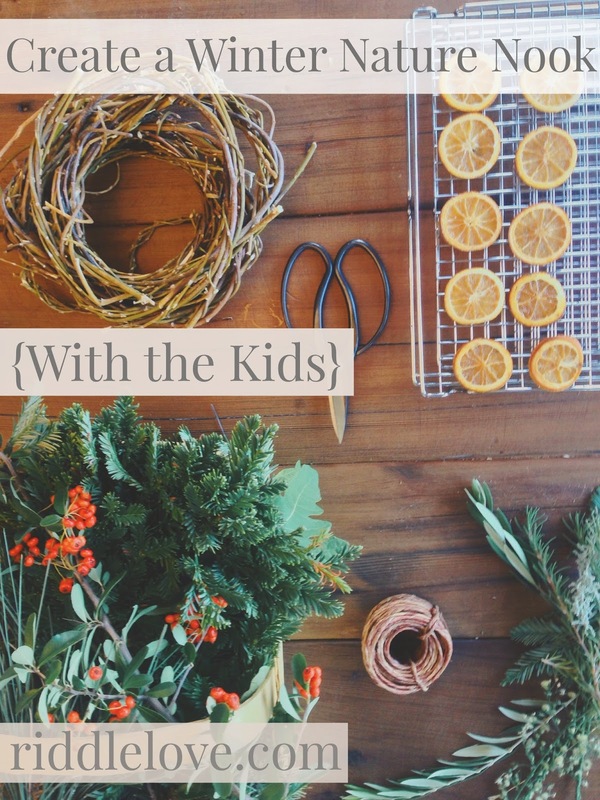 If you have any words of wisdom regarding Thanksgiving with kids and involving them in the kitchen, please feel free to share with the rest of us in the comment section below. Happy Thanksgiving! It's November! I am on a mission to take stress out of the holidays and infuse it with peace by making space for creativity and togetherness. Allowing just a little bit of forethought from here until the big day can actually make Thanksgiving enjoyable; even for those of us putting it on. Imagine that! I've assembled a little guide. Just plug in your recipes and boom. Thanksgiving done well. Let's get our Turkey Day Game on, shall we? Coordinate with others who will be apart of the feast: who is bringing what? Don’t forget drinks! Collect recipes for the dishes you are responsible to make, including turkey brine if you plan on brining. Google recipes you need if you don't already have them (be sure to read reviews; they're life-savers!). Make a grocery list of every item needed for the recipes you will be using. Buy all needed non-perishables NOW, before they are sold out. Also check expiration dates on perishables needed and buy what won’t go bad before Thanksgiving. The earlier you can get your supplies, the better! Avoid risking your needed ingredients selling out. Don’t forget the turkey! Be sure you have enough place settings for all your guests. If you are buying paper ware, do it now, as well as napkins, flatware, cups, and mugs. Do you have enough foil? Butter? Things for guests to take leftovers in? Better yet, ask guests to bring take-home containers for leftovers. Make a shopping list of any needed kitchen gear and place settings: roasting pan, enough pie pans/baking pans for dishes you are making, a baster, thermometer, if you are brining the turkey, be sure to have all the ingredients for brining as well as a brining bag. Do you have enough serving spoons? Ask friends, parents, aunts, grandparents, if there’s anything you can borrow. Start eating through your fridge, freezer, and pantry. Make room for Thanksgiving supplies by preparing your current meals with ingredients you already have. This will save money and give you the space needed. Prepare a super-easy menu plan from now until Thanksgiving, using as many ingredients that you already have (and won’t need for Thanksgiving). Find simple menu plans here. Make ahead and freeze: pie crusts, sweet breads, such as pumpkin and cranberry, and dough for rolls. Buy the rest of the perishables on your shopping list. After you have done this, you can sit pretty, knowing you have all your ingredients before the pre-holiday shopping frenzy when supplies become scarce. Add any festive touches to your home: download a Thanksgiving soundtrack, decorate the table with some mini pumpkins, candles, gourds… Have some fun on Pinterest! Sunday: If you're using a frozen turkey and plan on brining, move turkey to fridge to start thawing. Monday: If using a frozen turkey and aren’t brining, move to fridge to start thawing. Make cranberry sauce and store in fridge (it will stay good for up to two weeks). Tuesday: Begin cleaning the house and setting up for the big day: do you have enough napkins, toilet paper, and kleenex? Get all caught up on laundry so everyone has enough clothes to pull from and things like hand towels are clean and ready for Thursday. Make turkey brine (if brining) and store in the fridge. Brine recipes can easily be found on the internet if you don't already have one. Wednesday: Start cooking! If brining the turkey, get out he brining bag, place turkey inside, and pour brine over turkey. Close it up and store in the fridge for 16-24 hours (brining instructions are all over the internet if you don't have one). Defrost pie crusts and sweet breads you froze a couple weeks ago; leave them out on the counter for a couple hours, then let them finish defrosting in the fridge. Prepare appetizers and arrange on serving platters if you have enough fridge space and if you don’t have to reheat them (olives, cheese, pickles, cold cuts…). Make any other sides that will reheat well, like soups, yams, casseroles, creamed corn or onions (Brussels sprouts and green beans will need to be made Thursday). Rinse and prepare any salad greens, store in a zip-lock or air-tight container with a towel on the bottom to absorb extra moisture and keep fresh. Prepare the table: arrange chairs and place settings so all that’s needed is the food. Rearrange any furniture, if needed, to accommodate guests. Double check that you have those things that slip through the cracks, like foil, butter, things for guests to take leftovers home in (or remind guests to bring take-home containers). Thanksgiving Day! It’s go time! Crank up some music and work your magic. You’ve got this. 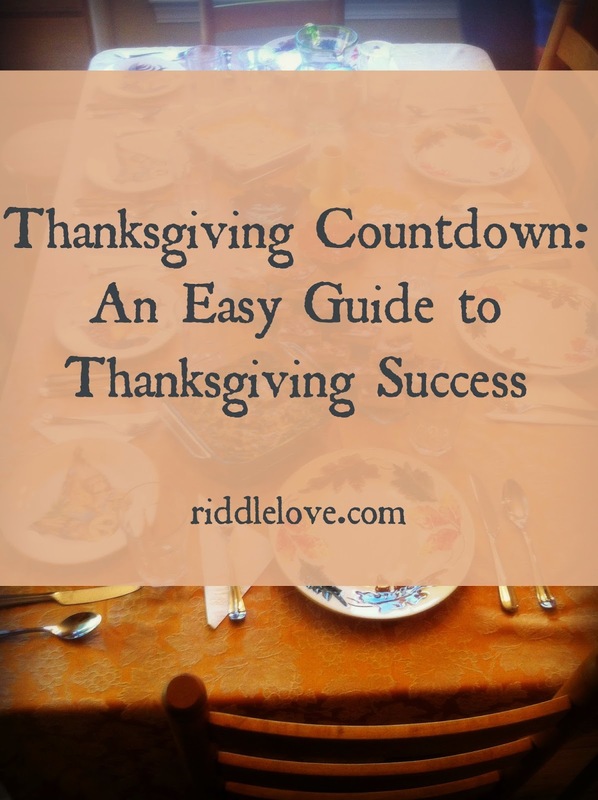 Follow your turkey-roasting recipe and get that bird in the oven! Give yourself some extra time and start it at least an hour early. If it’s done before guests are seated at the table, cover it with foil for up to an hour. Defrost pre-made rolls or dough in their containers on the countertop. Chill any drinks that need chilling. Prepare salad and cut veggies in their serving bowls/platters. Store in fridge until it’s time to eat. Make dressing but keep separate in the fridge. Make mashed potatoes and keep warm in a slow cooker with pads of butter on top to keep them from drying out. Bake/reheat as many casseroles alongside the turkey as you can during the last hour of roasting the turkey. Keep things warm by wrapping them in towels and storing them in a a closed ice chest. This will keep your dishes warm for up to four hours if you need them to! Pull out all appetizers a half hour to an hour before guests arrive. Make sure everything is warm. Do you need to reheat the rolls? set out butter, cranberry sauce, and any other garnishes on table. Let’s Eat! Sit down. Feast with your loved ones. No more fussing in the kitchen. Enjoy your hard work! Whip the cream for pies. Divide take-home leftovers and refrigerate all perishables within 2 hours after serving. No one wants food poisoning as their party favor. After taking all the meat off the turkey, place carcass in slow cooker, get out a turkey stock recipe, and start the stock (or refrigerate the carcass until the morning, then start the stock). Slip into some cozy clothes and let the turkey coma set in. Not many other things can make both kids and parents wince. Introducing kids to contributing around the house can be a lesson in patience and self control, for both child and grown-up. I've spent the past several years trying to find that magical chart that, once I tape it to the wall, the kids read it and get to work with all skill and know-how. The thing is, there's no such chart. I did, however, devour Dave Ramsey's book, Smart Money, Smart Kids: Raising the Next Generation to Win with Money, and his simple, logical method of setting up chores and handling money with kids. It just made... cents. Teehee. Because this is such a comprehensive subject, I decided to talk about it on YouTube. Please forgive the amateurish delivery of this info. I'm still getting the knack of this vlogging thing. Because of such humble beginnings, I'm still learning how to avoid bunny trails and losing my train of thought when a housefly keeps trying to steel the show (welcome to the real, organic country, y'all). I want to add a few more notes to what the video covered. I also highly recommend reading Dave Ramesy's book for more information and inspiration. We pay our children $10 a week if they get all their work done at a level they are capable of reaching for their age and skill level. Maybe it sounds like a lot, but this isn't just free money. We don't cover every luxury for them. To give them the opportunity of managing their money well, they are responsible for buying their friends birthday gifts. If they are invited to go to the movies with friends, they pay for their ticket and any snacks (if it's a family event, we like to treat them to the movies, and now that they know how much those tickets cost and all the work it takes to cover the tickets, they are far more grateful for that treat). If we go to a family fun center, vacation, or amusement park, we might cover a small amount of spending money, but if they want more, they have to come up with it. The goal is to never be a free-money machine for our kids. We provide for all their basic needs and a lot of fun things, but they need to think ahead and save accordingly so that when they're invited to do an activity with friends that costs money, they have worked and saved enough to be able to afford it. It also gives an opportunity for them to understand that money doesn't grow out of parents' hands. Ten dollars is also easily divided in percentages. Paying at least 10% in tithe is an easily-calculated $1. However, we encourage putting more than that into their "give" envelopes so they have the freedom to be generous to charities or when a collection is being made for a family or group of people in need. I've been guilty of this too many times. When I just want a job done right, and quickly, it's so easy to take over and do all the cleaning myself. This is destructive in many ways. First, I watch a wave of defeat wash over the child's face. Second, it teaches them that if they take long enough and do a consistently slow, sloppy job, I will end up taking over and they don't have to do the work. Third, I become a grumbling, seething, not fun parent who doesn't allow their child to hone their skill of feel the joy of completion. However, when children are still mastering a task, I do have to clean up after their job. I try to do this stealthily so they don't feel incompetent. They thrive off of praise and encouragement after doing their best, even when, on the inside, I might be moaning because I still have to re-do it and it would've been so much faster had I done it myself. But that's short-term thinking. 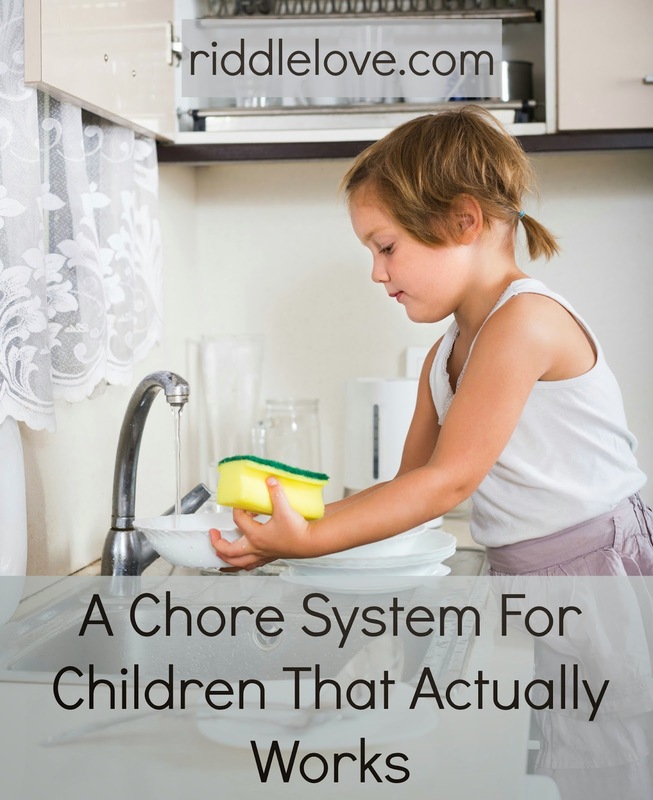 Keep in mind that one day your children will be skilled cleaners who you really can count on, even when guests are coming, and someday they will save you time because you won't always have to clean the area they just "cleaned." We want our children to always do their best. However, our expectation of each child should never be higher than what they are capable of doing for their age and however long they've been working on mastering a certain job. A couple of our children were overwhelmed by the thought of making their beds every morning. Granted, when you're on the top bunk, it's hard making that thing. I remember. I start with asking them to just flatten out their sheet and blankets as best as they can, and the more they practice, the better their bed will look. I also can't expect my six-year-old to wash the windows as well as my twelve-year-old. First of all, even with a stool, the little one can only reach so high. Secondly, she just isn't as strong as our tween. Their skill set will grow along with them. Our standards can develop with the children, but set the starting bar low enough to where they can feel proud of completing a job they did their best on, and that it's not completely and hopelessly out of reach for them to do. As parents, if our heart truly is to see the children thrive and grow, this will come naturally. Invest in a step stool or two. I bought two of them so our younger ones can use them at the same time when needed, which often happens. Little people can do so much more when they are able to reach things. Stools also give them better leverage when scrubbing countertops and washing dishes. Use non-toxic cleaners only. This is something that benefits us all, and we don't want our children exposed to fumes that can hurt them. It also keeps babies and toddlers safe if they end up getting ahold of the cleaners when the kids forget to put them away. Cleaning accessories can be fun. Some kids could care less, but when it feels like you're suiting up for a job, things can seem more official and important. Buying a pair of cleaning gloves (these are our favorite) for each child with their names written on them can help children attain a sense of ownership and importance, and that their work is the real deal; because it is! Laminate the chore charts and use a wet-erase marker to check off the tasks. It cost me $12 to laminate eight charts at Office Max. I felt it was a worthy investment. I used strips of packing tape as a kind of home-laminating technique on our first set of chores, but the ink easily bled through and our toddler found it fun to rip them. Laminated charts easily wipe off and are virtually indestructible. I like having the children use wet-erase markers because it holds up against smudging or erasing that can happen with a dry-earase marker when a hand rubs up against it as they check off another box or accidentally brush by the chart. As promised in the video, here's what our two lists look like (feel free to use and tweak them to fit your family if you want).